Superdry men's Snow Command Trophy jacket. A necessity for your ski trip this season. Featuring an adjustable and detachable hood, zip fastening and a snow skirt (to keep the snow out and you warm). This jacket has been designed with ease and practicality in mind, it has a media pocket so you can listen to your favourite tunes in no time, a ski pass holder on the sleeve to get on those lifts ASAP and large front pockets with zips. 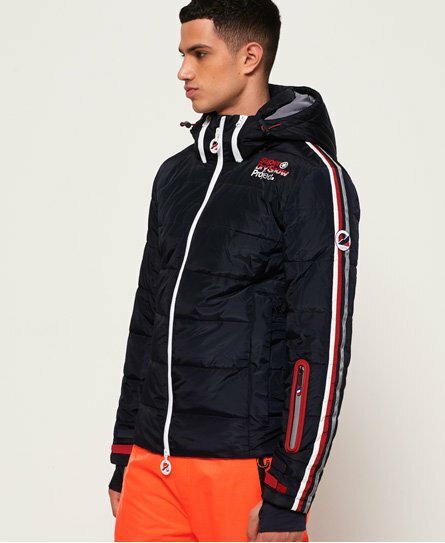 The Snow Command Trophy jacket is completed with pit zip venting that gives all that heat a quick escape, reflective detailing on the arms and an array of Superdry Snow logos.